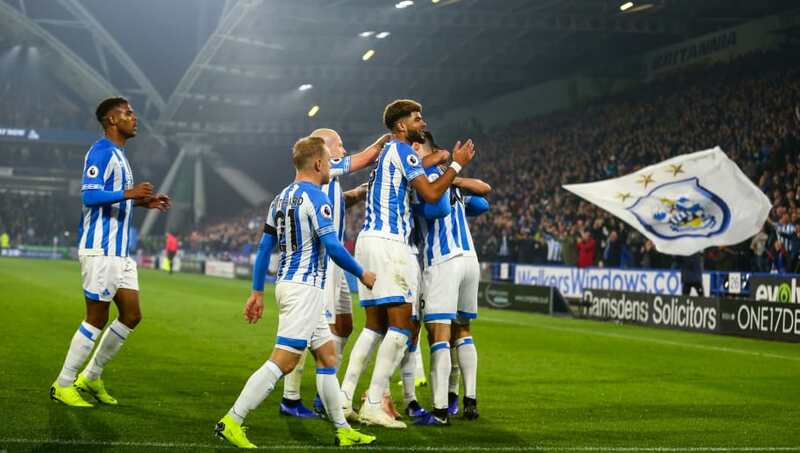 ​Huddersfield earned their first win of the season as they defeated a lacklustre ​Fulham 1-0 at the John Smith’s Stadium on Monday night thanks to Timothy Fosu-Mensah's own goal. The Terriers broke the deadlock on 29 minutes as Fosu-Mensah headed into his own net from Chris Lowe's cross. Remarkably, it was the Terriers’ first home league goal of the season, and their first for an incredible 11 hours of football. Fulham were unlucky to have a goal disallowed for offside on 75 minutes. Although goalscorer Schurrle was onside, Mitrovic wasn't, and his interference of play saw Schurrle's goal ruled out. In the end, it was the Cottagers' best chance of the game, as Huddersfield held on for their first three points of the season. Here's 90min's breakdown of Monday night's clash. For a team who were bottom of the Premier League at the start of the day, you would be forgiven for not expecting much from Huddersfield. However, the Terriers had a surprisingly great game. They showed confidence, they were dangerous in attack and caused Fulham problems. From Monday night's performance, you wouldn’t think that they had been winless after ten games. Starting XI: Lossl (6); Jorgensen (6), Schindler (7), Kongolo (6); Hadergjonaj (7), Mooy (7), Hogg (6), Billing (6), Lowe (6); Pritchard (7); Mounie (6). Substitutes: Depoitre (6), Mbenza (N/A). STAR MAN - At the heart of every ​Huddersfield move, ​Aaron Mooy was great on Monday night. Making his 100th appearance for the club, he created chance after chance, made strong runs and caused many problems for Fulham's defence. Without Mooy, it would be hard to see the Terriers as strong as they were. WORST PLAYER - Very few players had a bad game, but there was frustration for striker Steve Mounie. He should've scored at least one, and was visibly angered by his substitution in the 56th minute. ​Fulham showed little threat throughout the game, which wasn’t helped by sloppy play seeing them give possession away far too often. In fact, they only mustered one shot in the entire first half. When your attack comprises of a World Cup winner, a powerful striker and a pacy winger, that is unacceptable. Fulham spent £100m on summer transfers, yet they sit in the relegation zone. It’s no surprise that Slavisa Jokanovic is under pressure, and now it seems like it is a matter of time until he could be sacked. Starting XI: Rico (6); Fosu-Mensah (5), Odoi (6), Le Marchand (6), Sessegnon (6); Seri (6), Zambo Anguissa (6), Cairney (7); Vietto (5), ​Mitrovic (6), Schürrle (6). Substitutes: Christie (6), McDonald (N/A), Johansen (6). STAR MAN - In a game with little quality from the visitors, captain Tom Cairney was Fulham's only positive. Coming back from injury, he did his best to help the team and put in a good shift, but in the end his teammates' poor performances let the team down. WORST PLAYER - Although he wasn't the worst on the pitch, Timothy Fosu-Mensah had a night to forget. The young ​Manchester United loanee scored the decisive own goal and a half-time substitution will not have helped his confidence. This first league win for the Terriers is an important one, helping them off the bottom of the Premier League. They are back in action on Saturday, when they welcome ​West Ham to the John Smith’s Stadium. The loss sees Fulham replace Huddersfield at the bottom of the table, as the pressure mounts on Slavisa Jokanovic. The Whites face a very tough challenge next, as they travel to Anfield to face unbeaten ​Liverpool on Sunday.